For courses in Professional Communication and Workplace Writing. After teaching a course to college students pursuing trade careers, George Searles realized his students needed a book that focused on practical applications, rather than theory—and that explored workplace communication in a user-friendly tone. 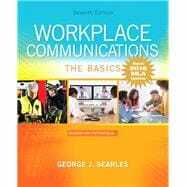 Workplace Communications: The Basics takes a down-to-earth approach to writing and communicating on the job, teaching the essentials in an accessible style appropriate for any student or course. The clear, concise nature of the book meets the needs of not only its originally intended audience, but the needs of students taking technical communication at a wide range of institutions for any major as well. The Seventh Edition retains and enhances the text’s pedagogical aids, rich examples, and practical exercises, preparing students to communicate successfully in any workplace environment. George J. Searles is a Professor of Arts & Humanities at Mohawk Valley Community College, specializing in journalism, business/technical writing, contemporary poetry, and Latin. He has also taught at Green Haven State Prison, Binghamton University (where he earned his Ph.D.), New York Institute of Technology, St. Elizabeth’s College of Nursing, Utica College of Syracuse University, and SUNY College of Technology, and on the graduate level for New School University. Currently he is an adjunct instructor of creative writing at Pratt Institute’s upstate campus at the Munson-Williams-Proctor Arts Institute in Utica. He has served on the governing boards of both the Modern Language Association and the North East Modern Language Association, presenting scholarly papers at the annual conventions of those and other such professional organizations. In addition, he has served as a communications consultant to many corporate clients and social services agencies, as well as the National Endowment for the Humanities and the National Science Foundation. Along with numerous articles, reviews, and poems in a broad range of popular and academic periodicals, he has published three volumes of literary criticism from university presses and five editions of Workplace Communications: The Basics, a Pearson textbook used on over 200 campuses here and abroad. The recipient of two SUNY Chancellor’s medals for excellence, he was named the Carnegie Foundation’s “New York State Professor of the Year” in 2002, and the New York State United Teachers’ “Higher Education Member of the Year” in 2003.